Honeycomb is the most amazing stuff – add the bicarbonate of soda to the sugar and watch as it explodes in the pan and grows before your eyes. 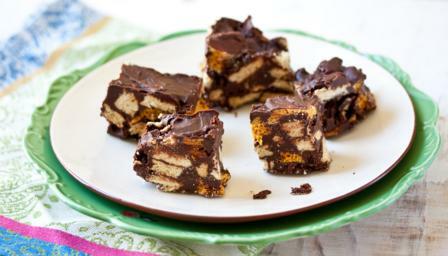 The honeycomb is then mixed with melted chocolate, syrup and biscuits to make a sticky, crunchy square. Visit the Red Nose Day site for Mary Berry's Bake Off Kit and information on the Great Comic Relief Bake Off book. Make the honeycomb first. Have the bicarbonate of soda measured and ready for when you need it, plus a wire whisk and an oiled baking tray. Put the sugar and golden syrup into a saucepan and set it on a very low heat. Warm gently for 10 minutes until all the sugar has melted, stirring occasionally with the wooden spoon. When the sugar is completely melted, turn up the heat to medium. Once the mixture has started to boil, leave to bubble without stirring until it turns golden-brown. Turn off the heat under the pan. Cover one of your hands with a dry tea towel or oven glove for protection, then take hold of the pan handle. Add the bicarbonate of soda and quickly whisk it in for a couple of seconds only. The mixture will froth up massively and you need to take great care as it’s extremely hot. Quickly pour it into the middle of the oiled baking tray. Don’t spread it out or touch it or the tray. Leave it to cool and harden, which will take about 30 minutes. Line a square 20.5cm/8in tin with baking paper. Use a rolling pin to break or bash up the chocolate into small pieces. Put them in a heatproof bowl and add the butter and golden syrup. Melt gently, over a pan of hot water, giving it a stir now and then. When the chocolate mixture is smooth, carefully lift the bowl off the pan and place it on a heatproof surface. Put the biscuits into a plastic food bag and use the rolling pin to break them up into chunks the size of your thumbnail. Bash up the set honeycomb into chunks roughly the same size. Add the biscuits and honeycomb to the melted chocolate and mix well so all the chunks are coated. Scoop the whole lot into the lined tin and spread it evenly, right into the corners. Cover with cling film, then chill in the fridge for about two hours, or until firm and set. Cut into 16 squares with a sharp knife. Store, tightly covered, in the fridge and eat within two days.